I received the following announcement from my friends at the International Commission for the Accreditation of Professional Genealogists. 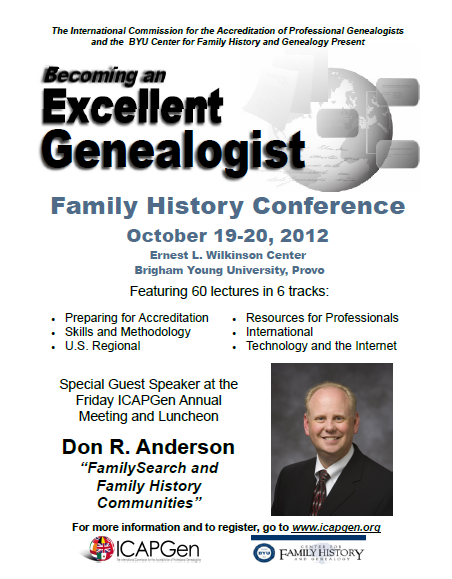 Registration is now open for the 2012 ICAPGen Conference: Becoming an Excellent Genealogist, presented by the International Commission for the Accreditation of Professional Genealogists and the BYU Center for Family History and Genealogy. This conference is gearing up to be one of ICAPGen's best conferences ever! You won't want to miss this event. Full conference registration includes a very nice luncheon on Friday and Saturday. We also invite you to attend ICAPGen's Gala Banquet on Friday evening at 6:00 p.m. I had a great summer traveling with my family. We went West to California and Utah for family reunions and fun with cousins. Now that we have returned from four weeks away from home my kids are back in school and I am back to working on the ProGen Study Program, my BCG portfolio, preparing presentations to give at genealogy conferences this fall, and updating my education blog. While I was in Utah I hosted a gathering of descendants from my third great grandmother, Mary Lawson Kirkman Hulet Cook. This meeting was specifically for those interested in family history and it was lots of fun to meet new cousins and honor this great lady. We shared stories, photographs and contact information so we can continue to share our research findings with each other. I have lots of plans and topics I would like to cover on this blog, but I also have a five month old baby so I will write articles as I am able (perhaps during nap time). 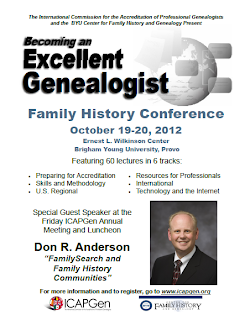 I will continue to post information on genealogy conferences, institutes, courses, webinars, and other online educational resources.